Trading Package simplifies the learning curve of a new platform. 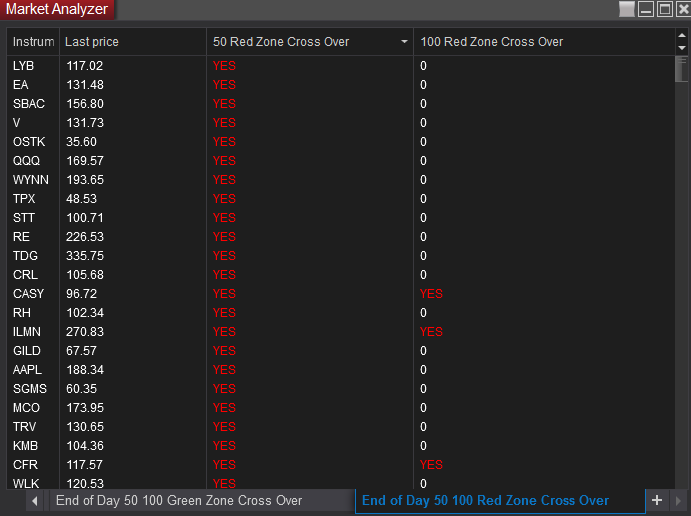 We have pre built NinjaTrader Workspaces with charts and scanners ready to use. The Trading System charts are easy to read and distinguish bullish and bearish indicators. Our proprietary Trend Shift Pivot Zone changes color as the price triggers the trend shift. A pivot is a change of direction. Green color is a current or implied Up Trend and Red color is a current or implied Down Trend. The upper left corner has a display box that shows the current algo plot price and the next plot level in either direction. The primary function is used with our Retracement Setups and the alert price is the trigger for probable resuming of the prevailing trend plot. This is the core of the Trading Package. 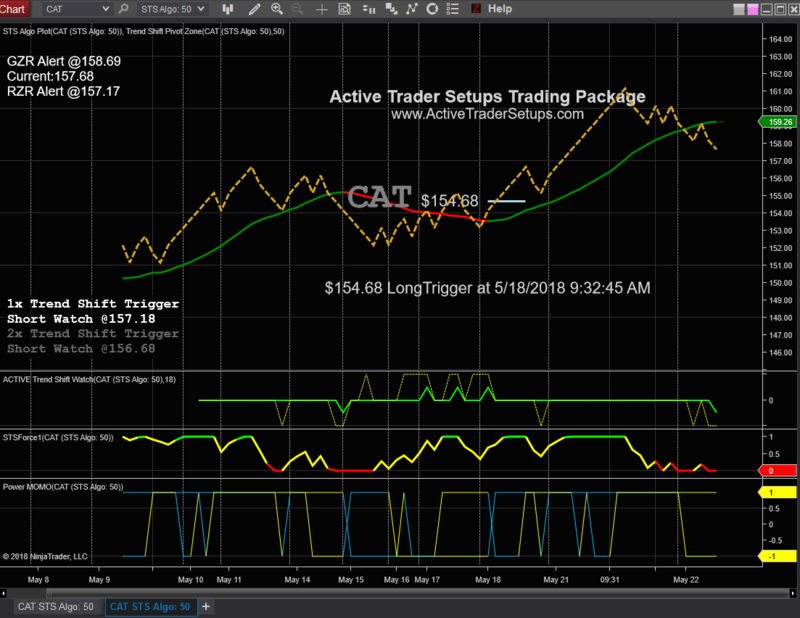 Our Proprietary System projects forward price action in both directions and predicts if the Trend will continue or change direction in advance of the change. When a change is projected the display box shows the 1x or 2x Trend Shift Trigger Watch Price. 1x is within 1 factor and the 2x is within 2 factors. Best to proceed with the below features before moving to page 3. Our custom Trend Shift Pivot Zone Indicator plot changes color to indicate the current Trend indicated by our Trading System. Easy to see the Trend at a glance. We also teach expected price action around the plot as the existing trend becomes in question. Upper Left corner display box: Current Algo Price of last plot price. Lower Left corner display box appears when active. ACTIVE Trend Shift Watch (this indicator can be hidden on the charts), when the plots are upward or downward the display box appears with a Watch Price displayed that would indicate a change in Trend direction. STSForce Strength indicates a high probability of price continuation. 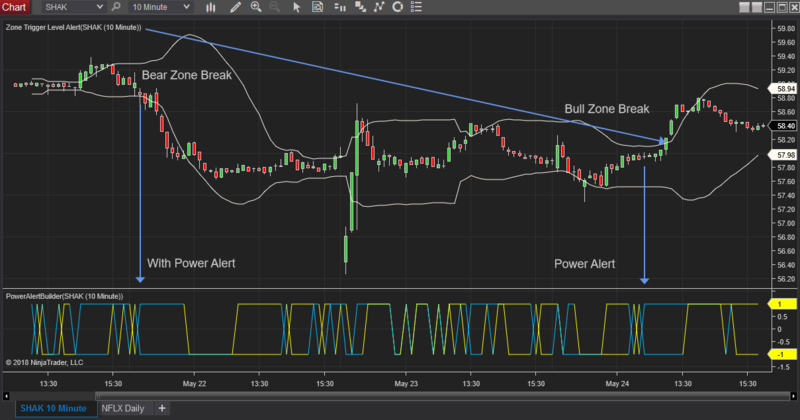 Power Momentum Indicator - this Proprietary Indicator is used with our Algo Charts and with our Bull and Bear Zone Scanner alerts. This indicator when shifting from 2 yellow 1 to 2 Blue 1 simultaneously indicates momentum in the direction of a new breaking price action. These indicators and be plotted separately or overlaid together to save screen space. Each of these indicators can be scanned and alerted independently. Great for a focus watch list when you are waiting on a Trend Shift on small or large factor charts or when you are focused on a few stocks that you are waiting for a another small edge before entering your trade. Scanners can only alert Trend Shift Cross overs as they occur Real Time. 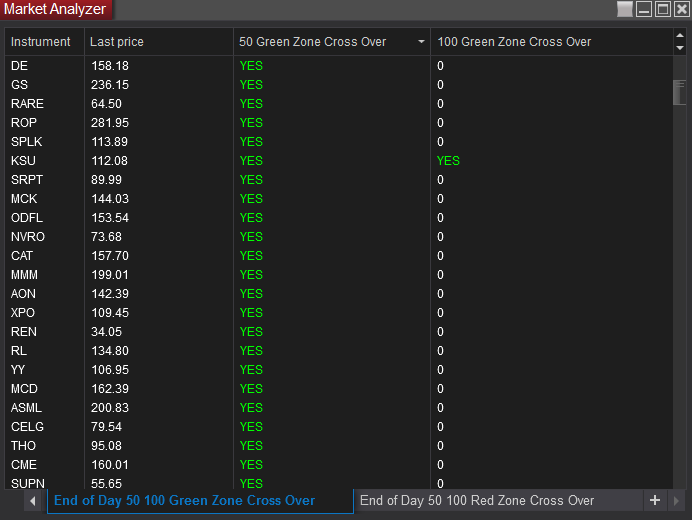 These custom End of Day Reports can be set up on for any factors for Traders Personal Watch List. They check the Today's close Trend Status compared to Yesterday close Trend Status and indicate YES if there was a Trend Shift during today's session. 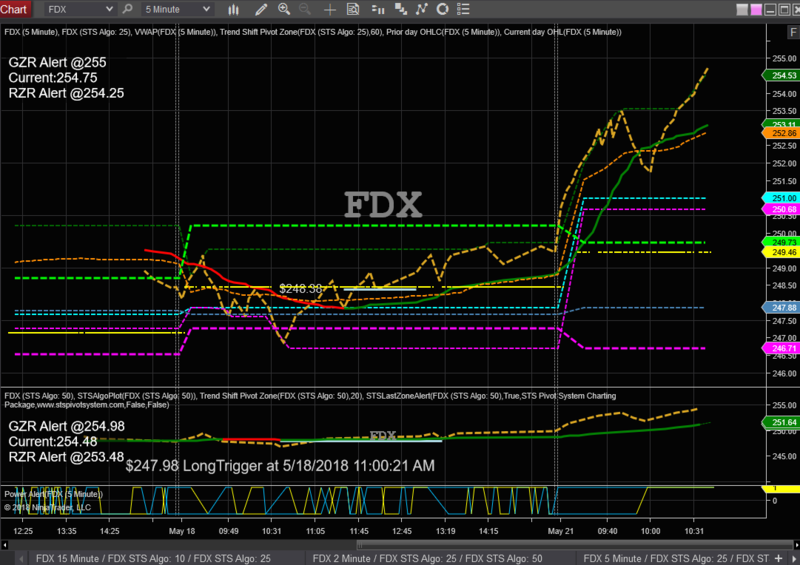 End of Day Reports comparing 25, 50, and 100 Factor Charts for Current Trend and Force Indicator to select stocks for trading considerations. Our Education and Training teach interpretation of these reports. *** Be sure to Ask about our Standard Candle Only Package for our Bull Zone, Bear Zone, and Momentum Scanners and Charts. Charts include Support / Resistance, Inflection Points, and Bull Zone and Bear Zone Charts (NO Algo Charts in this Subscription Plan. This is a 39.00 Per Month Package (no free trail - but we push the setup and License Fee $60 to the 3rd Month). This can be ran on many of the free data plans. The Bull Zone and Bear Zone break chart and Scanners can be used on any time frame charts 5 minute, 10 minute, Daily, or Weekly. The preferred condition is a consolidation break accompanied by Power Momentum Alert shift to 2 Blue 1's. The Power Momentum can be used independently as well. This chart overlays the 25 Factor and Algo Plot with short term support, resistance, and many other intra day inflection points to be informed of. The plots are taught in our education and training. The plots are highs, lows, vwap, yesterday's close, and today's open. Long Term Support and Resistance Plots. These plots work on all time frames and will plot shorter or longer term support and resistance based on the time frame of the chart. 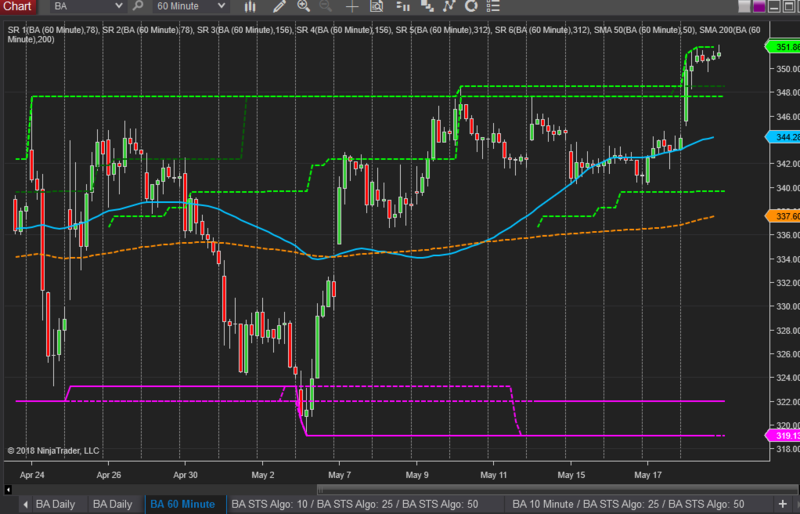 A 5 Minute chart will plot the last few days highs and lows. A 15 minute chart will plot 3 to 6 days back. A 30 Minute chart will plot 6 to 12 days back. The bigger the time frame the longer term the support and resistance plots.